"I can't keep the vision out of my head. They're my friends. I've got to help them." The 2018 May World Championships are now just a few weeks away, and they promise five great days of gaming for everyone in attendance. Players from around the globe will be converging on the Fantasy Flight Games Center to compete in the World Championships for five of the Star Wars galaxy's greatest games—Star Wars™: Armada, Star Wars™: The Card Game, Star Wars™: Destiny, Star Wars™: Imperial Assault, and X-Wing™. We'll witness top-tier innovation, skill, and competition. We'll find players dominating their games with surprising decks, squads, and armies. We'll watch dramatic turns of fortunes as big games are decided by desperate gambles. And we'll share the action with you—live as it unfolds—on our Twitch stream (Twitch.TV/FFGlive). 2017 Star Wars: Destiny World Champion Daniel Weiser. Following the action on our live stream is the next best thing to joining us at the Fantasy Flight Games Center. If you can't attend in person, you can still follow the action and drama. You can root for your favorite squadrons, troopers, Jedi, Sith, and players. You can join in the conversations on the Twitch chat, and if you catch a game that's new to you, the other members of the chat can help get you up to speed. This is the year's biggest event for each of the five featured games, and you won't want to miss a beat. Download the 2018 May World Championships Streaming Schedule now! Additionally, we'll have even more information on Twitter StarWars.com. You can check in at intervals for updates on the weekend's events, for summaries of the World Championship metagame, to learn who made the Top 16 for your favorite game, and to cheer on the top players from your local community. The competitions of the 2018 May World Championships don't begin until Wednesday, May 2nd, but the streaming coverage begins the day before. On Tuesday, May 1st, we're inviting early attendees to join us for the Hyperspace Report, a special event that we'll stream live on our Twitch channel. Featuring a panel of Fantasy Flight Games developers and hosted by Justin Bolger from StarWars.com, the Hyperspace Report will lead attendees through a Q&A style presentation about Fantasy Flight Games's upcoming Star Wars products and release schedule! Bound to a be a must-see event for Star Wars fans and gamers everywhere, this event won't be limited to just physical attendees, either. Our chat moderators will be sure to ask the panelists some of your most pertinent questions from Twitch and from Twitter @FFGames. Finally, we'll follow up Tuesday's panel with a more in-depth look at some of these upcoming products on Wednesday's stream. While the World Championships are rolling through their first legs and building up toward the action of the first elimination rounds, we'll offer coverage of our upcoming products, including game demonstrations and staff challenges that let you see these products in action. The 2017 X-Wing World Championship finals truly demonstrated the value of skillful piloting. Which squadron leader will fend off all challengers? Who will prove him or herself the most far-sighted fleet admiral? Will the Mercenaries once again prove victorious in the fast-paced skirmishes of the 2018 Star Wars: Imperial Assault World Championships? Will anyone take a deck built around indirect damage to the top tables of Star Wars: Destiny? 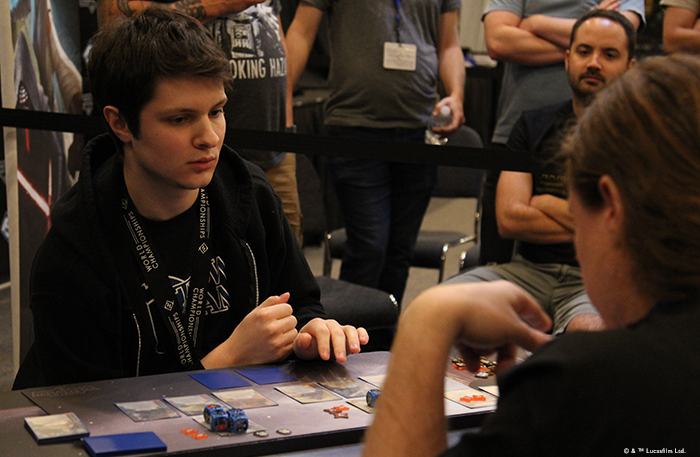 Who will conquer the field to become the final Star Wars: The Card Game World Champion? These are just some of the questions we'll see decided at the 2018 May World Championships. The best thing is to be there—to help decide the fate of the galaxy. But if you aren't able to attend, you can still be a part of the action. These are live events. There's no telling how the stories will unfold. Will we see a game's World Championship finals turn on a die roll? 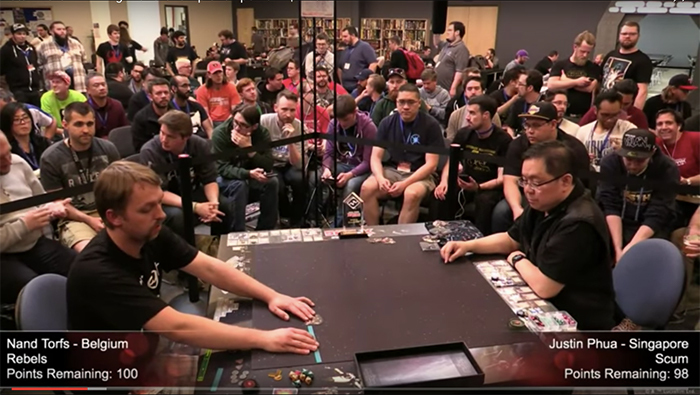 Will we see the X-Wing finals come down to the last two ships—each at one hull—as in the 2013 World Championship finals? How often will we witness the culmination of plans laid far in advance? How often will we see the world's top players switch gears mid-game as they adjust to their opponent's plans? Stay up-to-date with the hottest announcements. Catch all the action. Enjoy the drama. Revel in the top-tier competition. And learn from the world's best players. The streaming schedule is now online. Download it today to plan your viewing!